I’m happy to be Canadian, and I’ve got nothing against singing a country’s anthem within its official ceremonies (e.g., lawmaking institutions). However, I’m not as upset about this as some, and I won’t be signing the petition. 1. 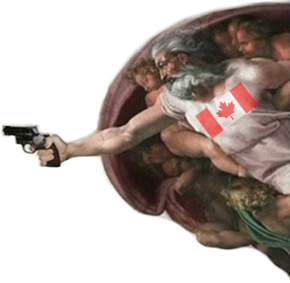 Those who continue to insist – erroneously – that our constitution makes God legally supreme (see, for example, the Christian Heritage Party of Canada) are the same sort now using the constitution as a defence for singing an anthem that asks God to defend Canada. What does this imply? It implies that they are more upset about excluding God’s mention than they are about excluding the singing of an anthem. Were Canada’s anthem not to refer to God, and these people still were to be as outraged, I’d be more sympathetic. 2. When we observe that new Canadians are among those most in support of continuing to sing the Canadian anthem in a legislature, we can be sure that some of them are doing so because they are happy to be citizens of Canada, instead of some war-torn, poverty-stricken country. However, we can also observe that many immigrants coming to Canada have little experience with secular society, are used to a God being supreme within their personal and public life, and support continuance of the singing of the anthem because it says “God keep our land…”. We saw this phenomenon when Ontario Premier Dalton McGuinty announced that he was going to drop the saying of the Lord’s Prayer from the official opening of the legislature each day. In response, all sorts of non-Christian religious people complained along with Christians, with the result that we now have an official opening ceremony in the Legislature that, on a rotating basis, praises and seeks guidance from one or two of up to 13 different “one true God”‘s. I’m reasonably confident that some of the new Canadians supporting the anthem-singing in town council do so so that room can be preserved for a future insertion of Vishnu, Allah, Buddha, and etc. 3. There are anti-country types – typically anarchists of the left wing or right wing sort – who are “anti-flag”, “anti-anthem”, “anti-oath”, etc.. By including “God keep our land…” in the anthem, we give such people a cover-story for getting love of – and loyalty to – country out of our governmental institutions…so that they can instead call for “world government” or “no government”. The real issue isn’t the official singing or non-singing of an anthem by law-makers. However, because few people want to admit that they are upset over the exclusion of praising of God in a legislature, most of the people who want Richmond Hill council to continue singing the anthem are pretending that the opponents hate Canada, or are about disloyalty to Canada, etc. (i.e., they are pretending that the opponents all belong to the third group I mention above). That’s an intentional misdirection, owing to the fact that it is doubtful that Richmond Hill’s council is comprised of anti-country anarchists or world-government types. As I see it, those who are very upset about the decision to stop singing the anthem in Richmond Hill’s council meetings actually are of the belief that “this is a country built on Judeo-Christian values, and we must continue to reinforce that by asking God to guide us, and to keep our land glorious and free, every day”. Both the assertion about Judeo-Christian values, and the call to reinforce that pretend heritage, are a mistake. The wealth and power and glory of the west was not the result of obeying Judeo-Christian laws and commandments. It was not the result of seeking guidance or help from an alleged god. To the contrary, the wealth and power and glory of the west was the result of violating those laws (e.g., laws against the accumulation of wealth, laws against usury, laws requiring one to be one’s brother’s keeper, etc.) and of placing reason above faith, and science and technology above prayer. The pretense of the three groups set out above could be eliminated by simply replacing “God” with “We’ll” or “Let’s”, but that’s not a hill I care to die upon. I’ll leave that to the NDP.